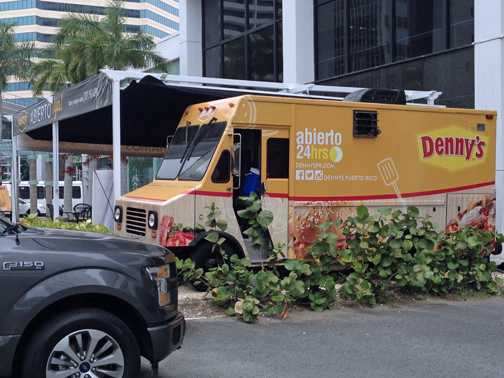 The Denny's food truck is offering a modified version of the restaurant menu to Hato Rey customers. The Denny’s food truck is offering a modified version of the restaurant menu to Hato Rey customers. Denny’s Puerto Rico, operated by franchisee Marpor Corp., has rolled into Hato Rey in what is the first food truck for the company on the island and nationwide, Ricardo González, vice president of the local restaurant chain confirmed Thursday. “We had this idea several years ago, and we were finally able to see it come to fruition. Our idea was to use the food truck for marketing: to take it to different events, fundraisers and areas where we didn’t have a restaurant,” González said. The rolling restaurant entailed a $60,000 investment and was first unveiled in the summer of 2016. The used truck was retrofitted with a new kitchen and wrapped to reflect the brand, he said. However, the concept was received with strong backlash from the food truck community, which blasted the “foreign company” for entering the segment and “wanting to overtake everything,” González said. “That wasn’t true, but after receiving much criticism on social media, we decided to hold back on the project,” he said. That was until a spot opened up on the corner of Ponce de León Ave. and Bolivia St. in Hato Rey about a month-an-a-half ago, when another food truck left the busy location on the Golden Mile. “For now, we’ll remain there because we have been well-received by customers. If we can go back to our original plan to use the truck for marketing purposes, we would like to participate in fundraisers, where we give the benefiting entity 20 percent of the proceeds of all sales,” González said. The menu offered at the food truck is a modified version of what is available at the 13 Denny’s restaurants islandwide. The truck employs five, who are part of Denny’s local payroll of more than 1,000 people, he said. If the food truck takes off, Puerto Rico would be pioneering the concept, which has drawn the attention of Denny’s franchise owners on the U.S. mainland, González said. “We had to really sell them on the idea, they had to approve the concept, which they really liked. They’ve been asking us for feedback on the project, to see what their options are for the mainland,” González said. “Something similar happened to us when we opened the Condado location with a full bar, which had never been done before, and which Denny’s is now allowing stateside restaurants to do,” the executive noted. As far as plans for new restaurants in Puerto Rico, González anticipated that the company is looking at specific areas where it would like to be, including Bayamón, Dorado or Manati. Fajardo and Humacao are also on the radar, and conversations with the Mayors of each of the Eastern towns have taken place to explore options. “We’re been looking for about two years, but last October we opened our newest location in Aguadilla, at an investment of $1.3 million, so we’re being thorough,” he said. Is the Denny’s truck still in operation after the hurricane passing on September? Hey Buddy!, I found this information for you: "Denny’s parks food truck in Hato Rey, 1st for entire chain". Here is the website link: https://newsismybusiness.com/dennys-truck-entire/. Thank you.